Is weight training safe for pianists? I’ve been wondering recently whether the weight training and gym work I do each week is actually good or bad for my piano playing. I go to the gym three times a week where I generally do a 20-30 min cardio warmup followed by around 75 minutes of weight training. As those of you who do weights probably know, the 24-48 hours after a training session involves a fair amount of muscle soreness as the torn muscle fibers rebuild and repair. It’s during this time that I’ve wondered whether weight training might actually be bad for my long-term piano playing and whether the building of muscles in my arms might be a bad thing in regard to flexibility. I’ve also thought much more about it after researching arm anatomy in my previous post. Make sure you keep fit! We all know that keeping fit is a good thing but piano teaching does tend to be a very sedentary existence and so, more than most teachers, we must make time to go for a walk, run or ride. I understand for many piano teachers, who often teach long hours at home and have their own family, this can be difficult, but it’s so important for our long-term health and ability to keep teaching effectively. At least make sure you’re taking a decent walk everyday to clear the mind and refresh the body. So, back to weight training. I also believe that a certain amount of muscle mass and bulk is useful for piano playing, particularly as it becomes more virtuosic. Although I have no particular evidence for it, I’m pretty sure that solidly or well-built people would find repetition of fortississimo chords and double octaves easier to pull off than slight people (I’m thinking Rach’s C#m Prelude, plenty of Liszt and many more), particularly when part of a long and difficult program that is physically taxing. Then again, I know plenty of small pianists who seem to cope just as well! I started researching about the pros and cons of weight training online and found a few resources and an interesting discussion at the PianoWorld Forums. With that in mind and my own experience to go on, I provide the following thoughts on making sure weight training is safe and productive. First up, always get a qualified PT or gym instructor to help put together a program for you and make sure they know you are a pianist and need to protect your wrists. The most important thing is that weight training has to be done properly, particularly in relation to the wrist. One way you can protect your wrists is to use wrist guards like the ones on the left. 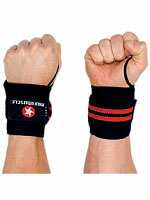 They provide support for the wrist and remind you to keep them as straight as possible when lifting. 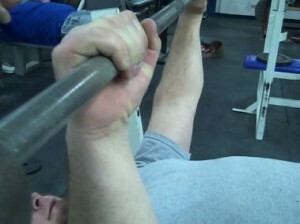 Firstly, let’s consider the bench press and any exercise where you’re holding weights overhead. It’s vital that your wrists stay in a neutral position (lower picture). The position below is very easy to fall into if you try to lift weights that are too heavy. Make sure your weights are light enough to lift with neutral (straight) wrists. 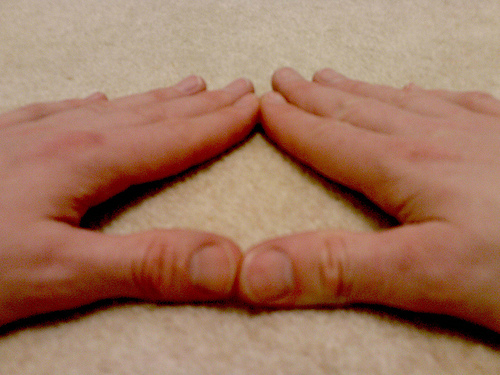 I avoid push ups and particularly “tricep” push ups where your hands form a triangle shape on the floor beneath you (see pic on the left) given that the wrist is holding your body weight at 90 degrees or less. Although they are great exercise and a perfectly natural thing to do, I wouldn’t be surprised if it put a fair bit of strain on the ligaments and tendons in the forearm and hand. One option is to do push ups while holding dumbbells so that your wrists retain a neutral position (there are also special-purpose handles for this purpose). These tend to be much harder, but are a great chest workout! Wrist curls (above) are probably best avoided unless you know you need to build strength and you start with very light weights. I’ve never done them but have seen others do them at the gym. Personally, I can think of better ways of spending my time! 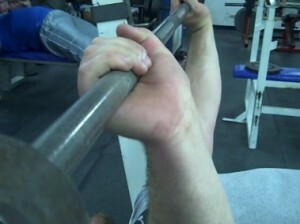 The bicep barbel curl (left) is another one where you can easily put strain on your wrists. You can see in this image that the guy (not me!) has his wrists in a neutral position which is vital for this exercise. 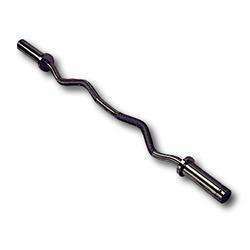 can isolate the biceps even more by using a bicep curl machine or resting your elbows on a bicep curl mat (as in image above). Either way, you must keep your wrists in a neutral position to avoid injury. I always try to use a barbel designed for bicep work (right) as it has angulations that allow you to maintain a more natural alignment of your wrists while lifting. This is much better than the straight bar above. In summary, I believe weight training is suitable for pianists as long as it’s done sensibly and with supervision at first. As long as the wrist remains in its neutral (straight) position and weights are only gradually increased, you should have no trouble. But… make sure you get a program set and regularly assessed by a qualified personal trainer. I can’t stress the importance of this enough, both for injury mitigation and to ensure that you continue to develop and grow by getting new programs set (preferably every month). Deadlifts/Back Extensions – I’ve tweaked my back doing deadlifts before and it made sitting at the piano quite uncomfortable for quite a few weeks. Make sure you get assessed as you do these to ensure correct form. I originally wrote this article in 2011 when I was first getting into weight training. I’ve now been working out by lifting weights (and regular cardio) for three years and have found no adverse reaction to any of the weight training that I’ve been doing. As a benefit, I’ve put on over 10 kg of muscle (I was pretty skinny before!) and feel more confident than ever before. I definitely haven’t lost any flexibility or agility at the keyboard and, indeed, I feel I’ve probably got a better command of my performing. I also tend to go to the gym first thing in the morning (6am) and so find that I’m totally fired-up to start my teaching in the morning. It’s an amazingly positive way to start the day! If you’ve got any questions about weight training as a pianist or teacher (for your students), please let me know. Keep in mind that I’m not a trained personal trainer or physio and my comments are only from my own experience.